The number of cars on Indian roads is increasing at a telescopic rate. To find a place to park on busy streets in Indian cities is like wrestling in which one seldom wins. Typically, to solve this problem, police often resort to ban car parking, but this cannot be a permanent solution. The answer to this problem is therefore to build multi level car parking lots. Multi-level car parking offers great advantages as it is able to expand vertically instead of using scare expensive ground space. What is Multi-level Car Parking? The simplest definition of a multi-level parking lot is a facility that uses vertical space rather than ground for providing parking space to cars. It is mostly automated and uses prefabricated industrial buildings made of steel and consists of a moving training that can take cars to several floors above ground thus saving land space enormously. Incidentally, multi-level car parking is an all-steel building that does not use concrete. This is again an advantage in a time when cement prices are shooting through the sky and sand is becoming expensive. The project advantage of using steel is that it cuts down construction costs by almost half and yet provides durability, strength and ease of maintenance. Though multi-level car parking system manufacturers in India had introduced the concept three decades ago, it is yet to take off on a large scale. However, in recent years, corporate companies are beginning to show much interest in it at least to provide car parking facilities for its employees and its visitors. The reason for this is not difficult to see as real estate prices started to boom and employees started to protest. Apart from corporate houses, the healthcare industry, shopping malls, cinema theatres, large apartment buildings and even airports are beginning to realise the benefits of providing multi-level car parking facilities to its patrons. The buck does not stop here either; some enterprising individuals too are expressing keen interest in providing car parking facilities in the public domain. With increased demand for new mass parking lots for cars, PEB manufacturers and multi level car parking system manufacturers India are investing heavily in multi-level parking design and construction. 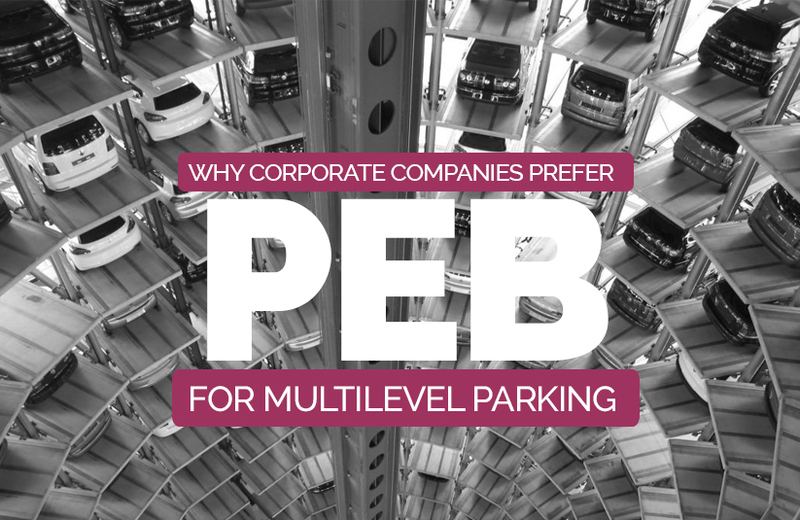 Why Corporate Companies Must Invest in Multi-level Parking? Multi-level car parking can bring in windfall advantages for corporate companies, especially if they have to attract customers and retain talented employees. With public transportation systems getting overcrowded and travel time increasing, cars are the only convenient dependable options for office commuters and families. When companies are able to provide parking space for its patrons, it is a great attraction that many will not want to forego when shopping or taking their families for an outing. Failing to provide this critical convenience often results in losing customers and business. Are businesses prepared to lose this critical advantage? The answer is an affirmative no and the only alternative in a competitive scenario is to provide parking in ample quantity, which only a multi-level parking facility can provide. It is safe and minimises the risk of theft, accident and congestion on the road. Makes life easy for drivers by reduced risks associated with parking on roadsides. Lot of time is saved in finding a parking space by the side of the road. Gives users peace of mind, especially if you own an expensive car. How to Order a Multi-level Car Parking Lot? Most, if not all PEB manufacturers who design and construct prefabricated industrial buildings also manufacture multi-level car parking lots. You can either choose one of the readymade models or order a customised car park that meets your specific requirements. Ordering an entire turnkey system has major advantages rather than going for a piece-by-piece approach in which you will have to design everything from scratch. Designing from scratch has both advantages and disadvantages but overall a turnkey contract will lessen your burden.